An expert is a person who has made all the mistakes that can be made in a very narrow field. – Niels Bohr, winner of the Nobel Prize in Physics. I bet I’ve made more mistakes than you have. So there! 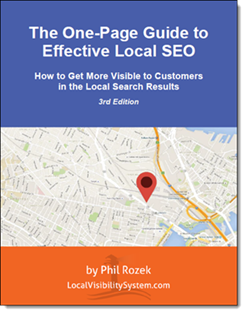 If you’d like me to hang on to that dubious distinction – and if you’d like to shorten the distance between you and better local rankings and more customers – then you and I should talk. We’ll schedule a time to get on the phone and kill your local-visibility challenges. You’ll get the benefits of my experience without stepping on all the landmines. What kinds of challenges can I help with? “I’ve tried everything, but my Google rankings are still in the doghouse. Those are just some of the challenges I can help you solve over the phone. Even if your problem isn’t on the list, bring it on. “Phil was great to work with. He has you fill out a form beforehand so that you don’t have to waste time (i.e., money) giving him factual info about yourself. He then gets on the call and starts to ask questions about my online and physical presence. Deep questions. I mean really good questions. He has a purpose for asking those questions. This is certainly not his first rodeo. We uncovered a rock and let me know what the problem was. Awesome. He then went through a series of suggested things to work on. Better yet, he prioritizes the list. Who has all the time in the world to do everything? No one. He tells you what the low hanging fruit is and tells you to get that done and why that will help you. What should you expect on the call? We’ll get most of the “who, what, when” out of the way beforehand, if you fill out my questionnaire and zap it to me. During the call, I’ll ask a few diagnostic questions and give you my suggestions. You won’t need to do anything else to get a clear action plan. You can sit back and take notes – or just sit back and have me send you my notes.